I was intruiged by Batsheva’s description of the retro “Rachel Imenu” style, so I decided to try doing a wrap that incorporated it into the style. She was right, I did feel a bit dated (who knew that scarf wrapping had eras/trends?) but I actually got a lot of nice comments throughout the day! 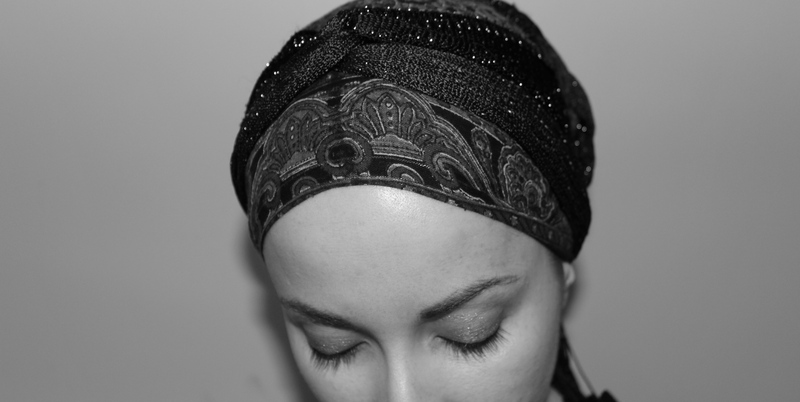 And the back of the wrap is one of my favourite ways to tie my bun area – the elegant double twist braid! It is beautiful. Loved the knot on top. It is different than the Rachel Imenu style of my time, but very beautiful. And who knows how Rachel Imenu covered? Oh the good old knot! That has been my favourite tichel style until recently, and I don’t really think it can ever look dated – it’s classical, and classic styles are always in fashion 🙂 You look absolutely beautiful! Is the “Rachel Imeinu” part that crossed knot at the top? Funny you say it seems outdated, because I see so many headbands in the stores that are in this style!